Fruit and pasta may seem like a modern restaurant trend, but this sweet-savory combination has been popular in Italy since the Renaissance. If you think it’s an odd combination, remember that tomatoes are technically a fruit and this, and other fruit, have a lovely citric sweetness that’s perfect with pasta. 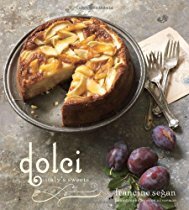 There are so few ingredients in these effortless dishes that it’s important to use only top quality ingredients: extra virgin olive oil, the freshest fruit and an exceptional pasta, like Felicetti, that received three silver sofi awards from the Specialty Food Association. 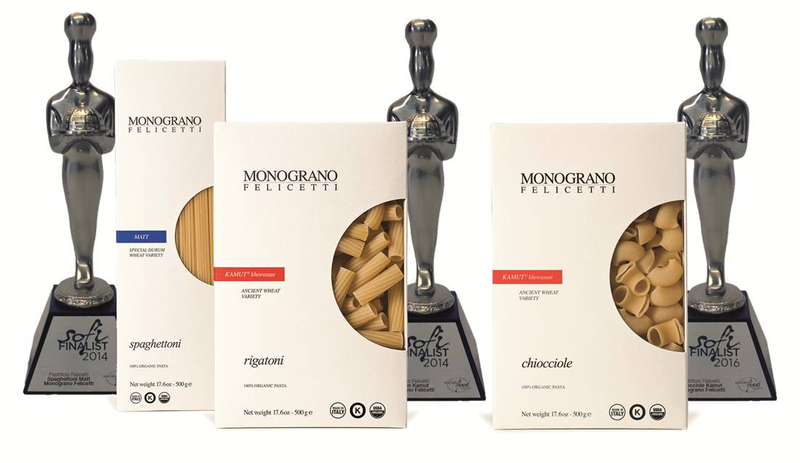 Monograno Felicetti pasta is made with organic heirloom grain with a rich, deep flavor that stays al dente until the last bite. Here are three simple fruit and pasta recipes that are especially wonderful in summer, when fruit is at its peak. This no-cook sauce is a classic from Sicily. 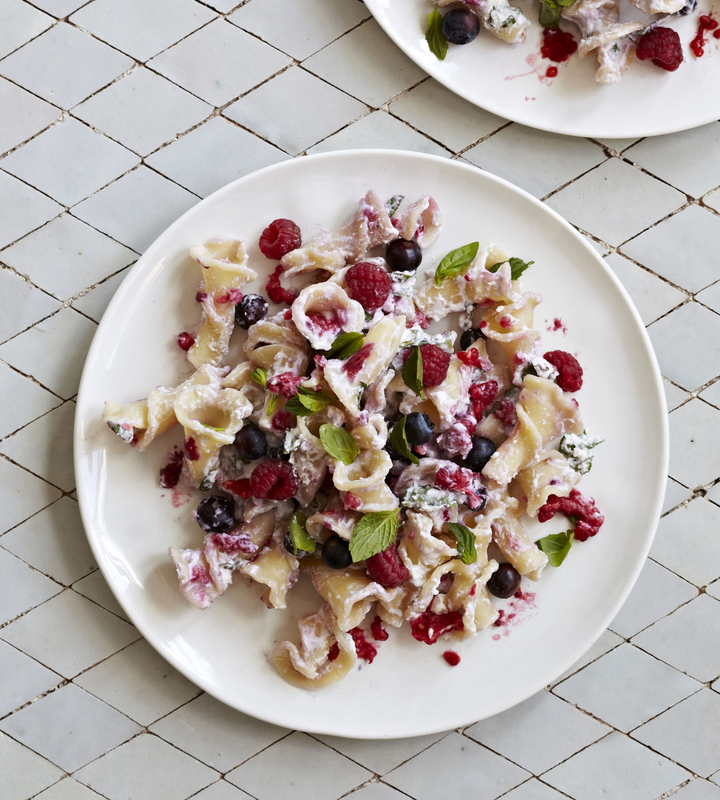 Berries, mint, and aromatic basil combine with ricotta to create a staggeringly simple-to-make, but spectacular dish. Put the berries, ricotta and herbs in a large serving bowl and stir the mixture with a fork to combine. Drain the pasta and toss with the ricotta mixture. Season to taste with salt and freshly ground black pepper. Fig and prosciutto is a classic Italian pairing and iconic appetizer. The combination is also terrific with pasta as a delightfully unusual first course. For a simple, no-cook sauce when fresh figs are in season, just toss hot cooked pasta with a little olive oil and sliced figs, then top with shaved aged cheese and prosciutto. 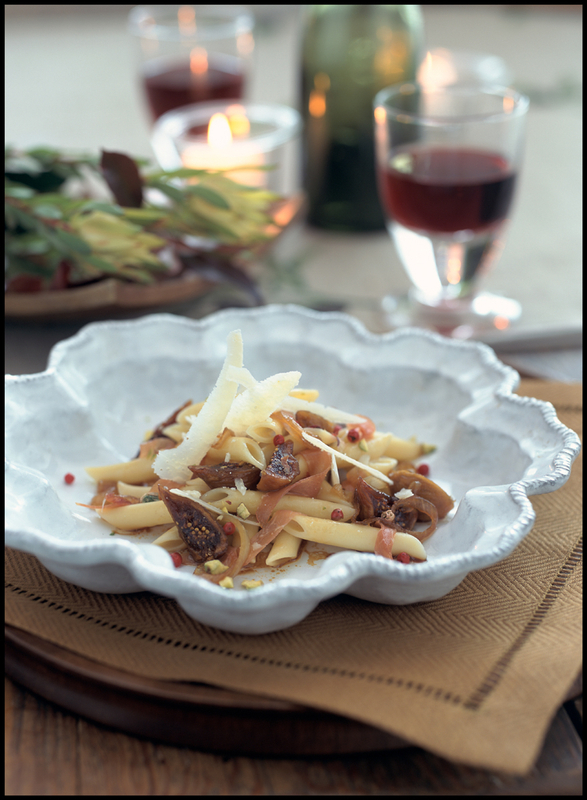 You can also enjoy this fig-prosciutto-pasta combination even when figs aren’t in season, using dried figs that have been softened in white wine and combined with caramelized onions. See the recipe below. Heat the butter and oil in a medium sauté pan over medium heat until the butter melts. Sauté the onion until translucent, about 5 minutes. Add the wine and figs and simmer until the wine is absorbed and the figs soft, about 8 minutes. Stir in the stock and simmer, covered, for about 7 minutes. Meantime, cook the penne according to package directions. Drain and toss with the fig sauce. Serve the penne topped with Grana-Padano, San Daniele Prosciutto, and a sprinkle of peppercorns. This next recipe features a very unusual combination of ingredients—sausage, roast beef, pears, grapes and even a sprinkle of amaretti, Italian almond cookies. Lombardy, a region in northern Italy, is renowned for its casconcelli, unusual ravioli, made with an odd but tasty assortment of ingredients including pears and grapes. No need to make ravioli, as the filling makes a wonderfully tasty pasta sauce especially when made with Monograno Felicetti pasta, which is made with heirloom ancient grains, and like fine wine, grown in only their ideal terroir. Melt the butter in a large skillet over medium high heat. Add the pancetta and cook until crisp, about 5 minutes. Remove the meat from the sausage casing and crumble into the pan; cook until browned. Add the roast beef, garlic, whole sage leaves, pear and grapes. Cook the mixture until the pears are soft. Meantime, cook the pasta in boiling, salted water until almost al dente. Drain and toss into the sauce along with 1/4 cup of its cooking liquid. Stir well and cook, adding more cooking liquid, if needed, until al dente. Stir in the zest, 1/3 cup of grated cheese, cinnamon, freshly grated nutmeg and minced parsley to taste, until well amalgamated. Season with salt and pepper and serve topped with more shaved or grated cheese and a sprinkling of amaretti crumbs, if using. from Riccardo Felicetti, CEO of Felicetti Pasta Company and President of the International Pasta Organization a nonprofit organization of pasta makers from dozens of countries. 1 Use a big pot and lots of water so the pasta has room to move while it cooks. Use at least 1 quart of water for every 1/4 pounds of pasta. 2 Think horizontally when cooking small amounts or filled pasta. When making long pasta like spaghetti for just one person, Italians put it into a wide shallow pan. You need only fill the pan with enough water to cover the spaghetti horizontally not vertically! 3 Never put oil in the water. It prevents the pasta from releasing its starch and absorbing the sauce. 4 Do not add the pasta until the water boils or the pasta becomes gummy. 5 Use the time on the box only as a general guideline. The best way to tell if pasta is ready is to taste it. Start tasting 3 to 4 minutes before the package’s suggested cooking time. 6 Never rinse pasta. The starch on the pasta helps sauces adhere to it, and is a thickening agent for the sauce, too. 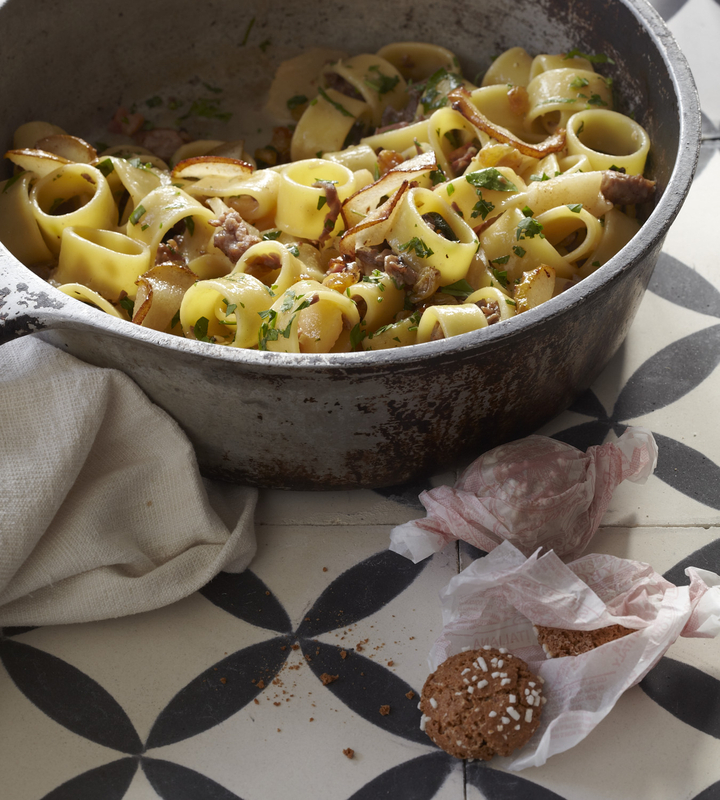 7 Always save a little of the pasta cooking water to toss with the pasta and sauce to thicken and meld the flavors. Again, it’s that starch that helps bring everything together.